Vincent Willem van Gogh, better known to the world as just Van Gogh, is one of the most prolific (if not THE most) artists of all time. A tall order but for anyone who has ever had the chance to view his work, especially in person, can tell you; his painting are more than painting, they are expressions. Emotionally compelling images of pain and suffering mixed with astonishing beauty. Van Gogh was a Dutch Post-Impressionist painter born in Zundert but who spent one of the most important years of his life as painter in Arles, France. Arles and the provincial countryside inspired him to create brighter and more exciting landscapes. Despite the impact he's made in the history books, his works weren't appreciated during his lifetime. After years of poverty and mental illness, he committed suicide at the age of 37. Arles, a large city in the French region of Provence, has a long history and was once an important Roman city. There are signs of occupations as early as 800 BC. The Romans took over the town in 123 BC and continued to enrich the city with their incredible architecture and infrastructure. Emperor Constantine, I built roman bath houses and his son, Constantine II, was born in Arles as the emperor loved the city so much. In 408 BC, the new emperor made Arles the capital city. Arles became renowned as a cultural and religious centre during the late Roman Empire. For hundreds of years, Arles continued to hold an absolute atmospheric power over the those in power. Arles joined the countship of Provence in 1239. Due to its proximity to the river, it was a mighty trade city, but in the 19th century, with the advent of the railroad it's significance began to diminish. The town became stagnant, with little to no modern development. 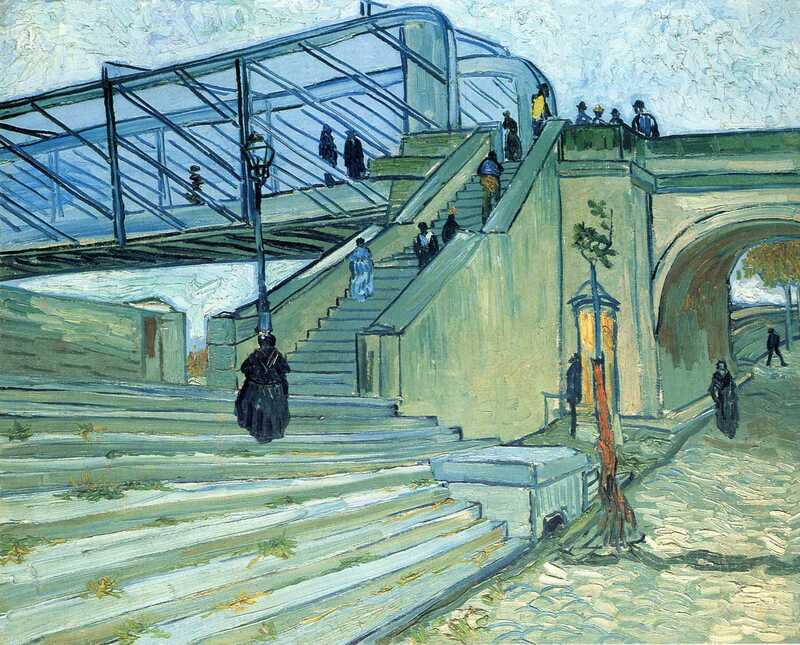 This was part of the reason which Van Gogh was so drawn to the city. If you are driving into Arles for the day, to the best place to park your car is in the Parking Garage near the Post Office. This is just on the outskirts of town meaning you won't have to drive through too many narrow streets or worry about paying a huge mark up for a lot in the city centre. This parking lot is very reasonably priced and right beside the first stop on our tour. If you'd rather stay the night, the best place to stay to get an incredible Van Gogh inspired night's rest is L'aubergine Rouge. This small, bed and breakfast is tucked away in the southwest corner of Arles on one of the most darling streets you'll ever wander down. They have several rooms inspired by the painter and while he never stayed here, you will feel like you're living inside one of his paintings. The walking tour will wind you across the city of Arles, through its narrow, quaint and beautiful cobblestone backstreets, along the Rhone River and into the various picturesque squares that Arles is so famous for. It will show you the various works of art which Van Gogh painted while he was living in Arles and the buildings he frequented as a resident of this historic city. The map of the tour is located here or at the bottom of this post. 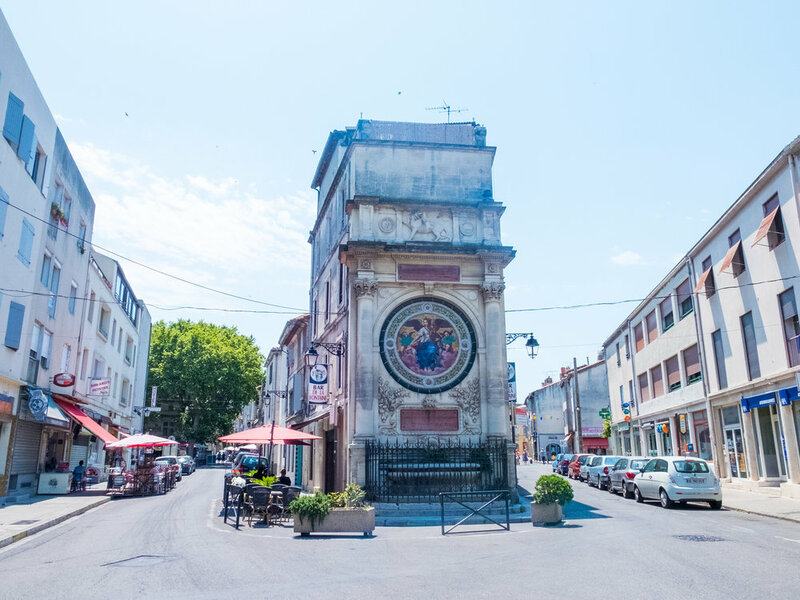 Throughout the city of Arles you'll find various plaques and easels with pictures of Van Gogh's paintings who's scenes reflect that location in Arles. Keep your eye out for them! While some of them can be a bit hard to find, just look for a crowd of tourists huddling around a small wooden sign and you'll have found it! 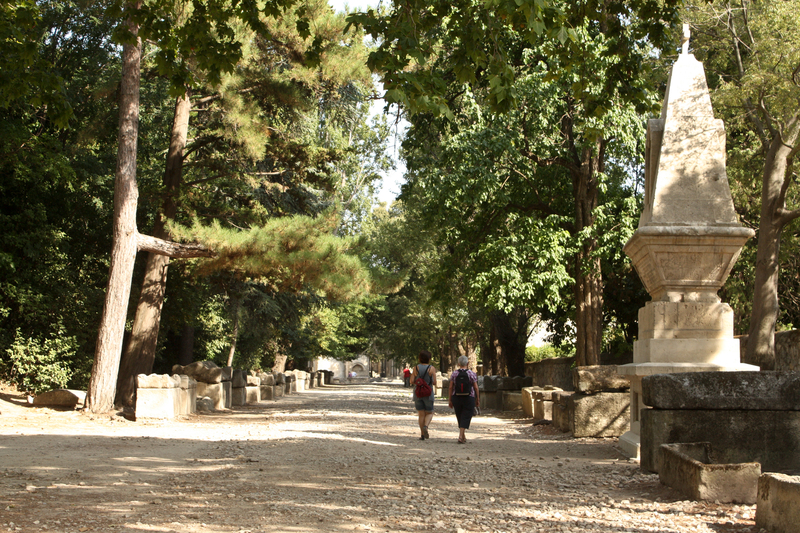 The first stop on the walking tour is the Alyscamps Necropolis. Van Gogh painted four scenes in 1888 sitting in the ancient Roman ruins. Paul Gauguin was staying with Van Gogh during this period and although their relationship was fraught with hardship it also inspired the best in both artists. Van Gogh gifted one of his Alyscamps painting to Gaugin and it hung in his room for years. The Alyscamps is one of the oldest Roman ruins in Arles. Roman cities didn't allow burials inside the city limit for fear of the death infecting the living, and therefore roads into the city were often lined with tombs and mausoleums. The Alyscamps was THE place to bury! People who have their bodies shipped from all over Europe to be buried here. But during the middle ages when it became more traditional to be buried in a church graveyard the necropolis fell out of fashion. In the Renaissance, the old roman sarcophagi were being given as gifts to visiting dignitaries and looted by local thieves. It fell into disrepair and eventually was a forgotten piece of history. Although the UNESCO World Heritage group has since turned it into a heritage site, at the time Van Gogh and Gaugin would visit it was still an overgrown, naturally beautiful environment. Walk north along the pathways in the park until you can exit to the east of the Roman Amphitheatre onto Rue Porte de Laure. Continue walking along until you reach the imposing Roman Arena. Built in 90 AD, the amphitheatre was capable of seating over 20,000 spectators. People would come from far and wide to watch chariot races and bloody hand-to-hand battles. Unlike the Colosseum in Rome, this amphitheatre is still used for concerts and festivals to this very day. Van Gogh painted a scene in 1888 entitled Arena in Arles. The painting is more focused on the spectators than the action or environment. It is a rough and tumble painting. Quick brush strokes and unfinished shapes are obscured in the background. The speed of the painting reflects the voracious atmosphere of the bullfights. A small bull can be seen off in the distance, and the spectator are all excitedly turning to chat with their neighbours and cheer for their favourite fighters. This jittery motion that is used throughout the painting was a technique that Van Gogh perfected under Gauguin's influence. His paintings of dance halls also had the same, almost unfinished approach which conveyed to the viewer that idea of places with so much movement and excitement they simply couldn't be captured in stillness. From the arena, walk north along Rue Voltaire. This street is like taking a step back in time. Cafes and restaurants pour out onto the street. Dazzling awnings hang off ancient stone buildings. Pastel shutters brighten up the rainiest day. There are so many little scenes you will see as you walk which could have stepped right out from one of Van Gogh's paintings. Shortly after arriving in Arles, the stagnation which he experienced in Paris disappeared. This creative spark alight once more he painted View of a Butcher’s Shop. One can imagine that this butcher shop perhaps was painted from the room he stayed in. He didn't stay on this street for long as he continued to have disagreements with the landlord, but walking up and down this otherwise ubiquitous street gives you a sense of the area Vincent explored when he first came to Arles. While he might not have loved his landlord, he did love the neighbourhood as he would soon move into his iconic Yellow House which was just up the street. As you near the end of the Street, Rue Voltaire turns into Rue de less Cavalerie. You will pass through the two giant aged guard towers which are surrounded on either side by the ancient city walls. Across the roundabout, you'll find the easel with a painting on it of The Yellow House. Behind it stands what now is a simple bistro but this was once the location of Van Gogh's beloved home. The house had four rooms and small studio. Vincent painted the entire thing bright, sunflower yellow. In the painting, you can see a train rushing by in the distance. These trains were Vincent's way into the countryside, which more than any one woman, was his beloved muse. He loved the city, but the wild sunflower fields, blossoming fruit trees, charming peasants and golden wheat fields were where his brush came alive. Nuit étoilée sure le Rhône is an explosion of blue; Prussian blue, ultramarine and cobalt are contrasted with intense orange and yellow from the gas lighting reflecting in the water. A man and his wife walk along the shore away three boats, bobbing in the water. Whereas Starry Night is a dreamlike fury or brush strokes, Nuit étoilée sure le Rhône is a much calmer scene. The brush strokes are evenly paced and even the lights on the water are still, not a single rippled disturbing them. As a kind of cosmetic coincidence, the Vincent van Gogh Foundation in Arles is located only a few minutes south of the Musée Réattu. In 1983, Yolande Clergue founded the Association for the Creation of the Foundation Van Gogh. He was a long time resident of Arles and believed that there should be an institute to study and educate people on Van Gogh's influence on modern artists in Provence. 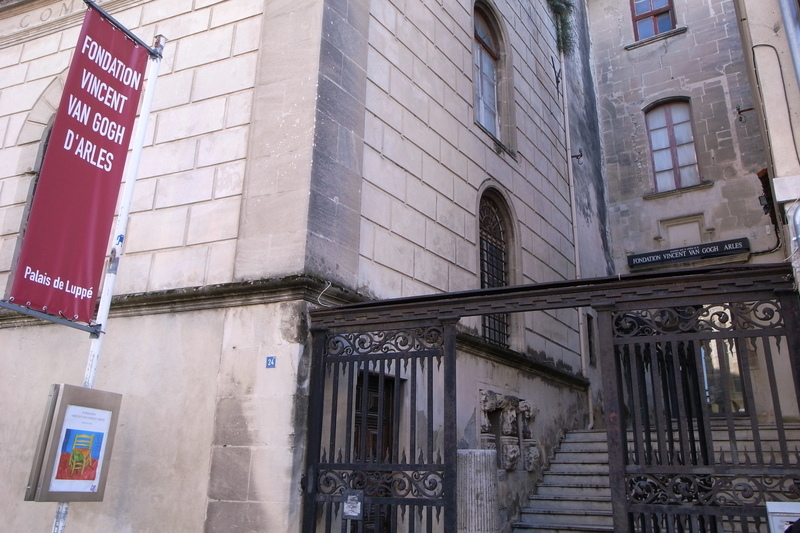 In 2010, the city of Arles gave the historic Hôtel Léautaud de Donines to the institute, and it was renovated to become an educational space. Today you can come in and see a sparing few original letters and perhaps one or two of Van Gogh's paintings, but the majority of the works are from modern artists influenced by Van Gogh and the city of Arles. Walking along Rue du Dr Fanton and turning down Rue de la Place, you will come up the Place du Forum. The Place du Forum was once the historic city centre during the Roman ages. You can still see one of the ancient columns embedded into the side of the Nord-Pinus Grand Hotel. Despite Vincent's lack of popularity in his lifetime, these days Van Gogh is big business. Le Café Van Gogh which stands here today isn't the original cafe from the painting but has been done up to look as much like the original as possible to help draw in the tourists. While the square is pretty busy and expensive, it is also a stunning place to sit with a coffee and enjoying the scenery. From the Forum, walk south until you reach the old Hospital Courtyard. On December 23rd, 1888, Vincent cut his ear off in a fit of madness and jealousy and gave it to the prostitute he and Gaughin were both in love with. He was admitted to the Hospital in Place Félix-Rey where he was treated by Dr Félix Rey. Dr Rey felt sorry for Vincent but knew he was incapable of dealing with his madness since they were only equipped to help heal the inquiry to his ear. Throughout his stay, Vincent would chase the duty nurse, bath in coal buckets and finally, placed into isolation. On his more lucid days, he would be allowed into the courtyard to paint. And paint he did. Even to this day, this courtyard manages to bring a sense of peace to even the most scattered mind. The golden walls seem to glow in the sunlight. The garden is full of lustrous flowers which burst open in the afternoon. Van Gogh's painting, Hospital in Arles, depicts the courtyard in 1888 and looking at it today, you can barely see the passage of time between the two. He created two additional paintings during his stay here. One was a gift the Dr Félix Rey, a portrait of the doctor which Vincent gave him as a gift for all his kindness. 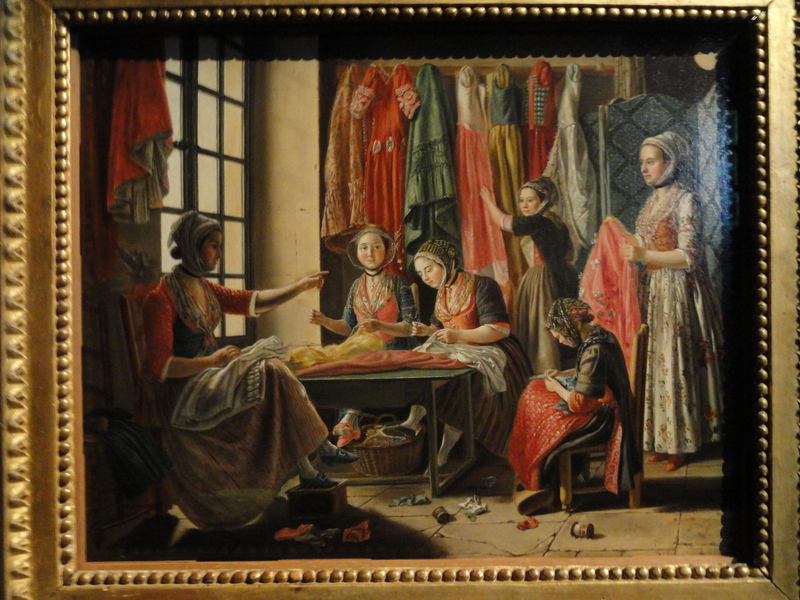 The second is entitled Ward in the Hospital in Arles. The scene is quiet and simple but the small distortions which Vincent made to represent the isolation and confinment he felt while living here. In 1889, Van Gogh was committed to the Saint-Paul de Mausole asylum in Saint-Rémy de Provence. From there managed to channel his pain into one of the most impactful paintings, Starry Night. This painting is all about dream versus reality. The natural and the divine. Van Gogh's perspective on the reality he lived where no one could see how incredible he was and the dream he had to be a star were very different. The swirling sky is a high contrast to the rigid city landscape below. Like a window into the heavens, a wonderful dream unlike our structured reality. Walk out to the centre of the Pont de Trinquetaille where you'll have a beautiful view across the Rhone River. Looking out, see if you can spot all those magnificent colours Van Gogh spoke about in his letter. Van Gogh is an artist whose use of colour is unparalleled. He saw the world in a way that many of us simply miss. Take this time, put away your phone or camera for the moment and simply look over over the horizon. While Van Gogh's depression was something he couldn't overcome, there is no doubt that, at least for a time, Arles gave him a momentary respite from the overwhelming sadness he felt in his soul. And no matter who you enter Arles, I hope that it brings you the same sense of peace which Van Gogh felt and perhaps you'll even see a little bit of that magic Van Gogh etched into history in his paint.